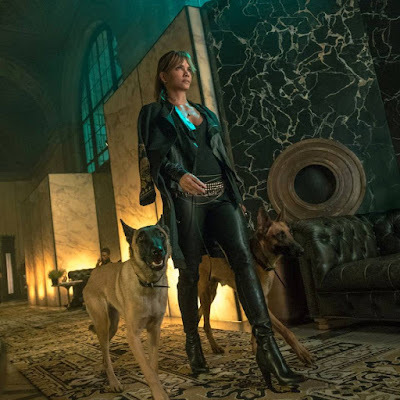 Last month, the news arrived that the cast for John Wick: Chapter 3 would be adding the likes of Halle Berry, Anjelica Huston and Asia Kate Dillon, among others. Now we know what at least Berry will look like in the movie, as the film's official Twitter account has released an image of her character Sofia, with two canine companions. Chapter 3 finds Keanu Reeves' title character in even more hot water than usual. He's on the run for two reasons... he’s being hunted for a global $14 million dollar open contract on his life, and for breaking a central rule: taking a life on Continental Hotel grounds. The victim was a member of the High Table who ordered the open contract. John should have already been executed, except the Continental’s manager, Winston (Ian McShane), has given him a one-hour grace period before he’s excommunicado – membership revoked, banned from all services and cut off from other members. John uses the service industry to stay alive as he fights and kills his way out of New York City. Sofia is apparently on his side, and he'll need all the help he can get. Also on the new faces roster? Jason Mantzoukas, The Raid's Yayan Ruhian and Cecep Arif Rahman, Tiger Hu Chen, plus Westworld's Hiroyuki Sanada as one of the biggest threats. Laurence Fishburne, Common, Lance Reddick and Ruby Rose are all reportedly back for more, with Chad Stahelski once again directing and Derek Kolstad providing the script. John Wick: Chapter 3 is aiming for a 17 May release in the States and here next year.